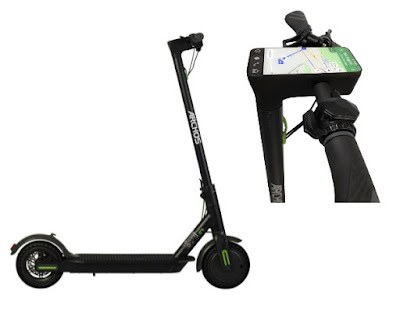 ARCHOS has introduced Archos Citee Connect, the world’s first scooter with a 5-inch touchscreen running Android 8.0 (Oreo) offering all the functions of a smartphone, including 3G connectivity and GPS for navigation and access to several apps and services. The display is protected is against shocks and bad weather. It shows speed, distance traveled and also remaining battery level. It has ergonomic handles and large wheels (8.5 inches), puncture-proof and dimpled for better suspension. It has a 36V battery that gives it a range of over 25 kilometers in urban areas. The battery life can be increased by 15% with its energy recovery system, which automatically recharges the battery with each braking. It can also be charged via a docking station. It has been designed and assembled in France. It comes with a reel lock, integrated into the chassis and controlled by an application installed on the dashboard. It is easily shared remotely via a dedicated application hosted on a smartphone. ARCHOS Citee Connect is priced at € 499.99 (US$ 615 and will be available in Summer of 2018. It will be showcased at the MWC 2018 (Hall 6 – Stand B60) in Barcelona.